Usually, when it comes to explain Armin Strom watches, it always ends up with the concept of the 4 elements. 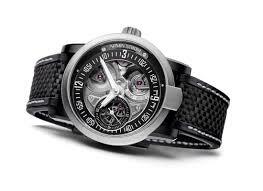 Most of the timepieces created by Armin Strom are declined in 4 tastes: fire , water, earth and air. 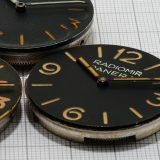 However, one collection sets an exception, with bridges and plates made from original motor block of an F1 car, carbon inserts on the dials and straps and a black colour scheme. So, the Racing collection adds some more Formula 1 taste to a package that actually remains very close from the rest of the collection. The strength of Armin Strom is to offer a single design, highly recognizable and to differentiate timepieces with special movements. All of the watches proposed by Armin Strom have common features: off-centered dial, skeletonized movements and a case with a protruding strip at 6. The Armin Strom Racing Gravity is clearly a swiss sports watch. It has this sporty feeling in its design, in the colours used and in the materials employed. 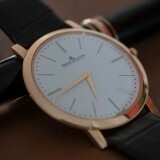 The size and the design do not sound like the restrained elegance of a tuxedo watch. Features are also simple as we’re in front of a time-only watch: hours and minutes on the central axis and small second at 9 o’clock. 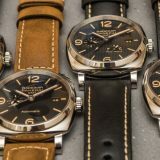 It could be that simple by only looking at the functions, but in reality, the movement got way more to tell than only time, as it comes with plenty of pleasant details and specifications, realized with pretty good watchmaking skills. 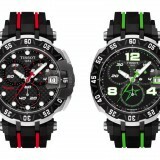 The Armin Strom Racing Gravity comes with the brands usual case, declined here with a new colour scheme. 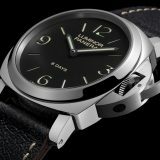 The case measures a solid 43.4mm x 13mm and is made of both titanium and black PVD stainless steel for the central part of the case. Considering the size, the use of a case fully in titanium could be welcome as it is lighter that steel, more resistant to scratches and PVD works simply better on titanium. 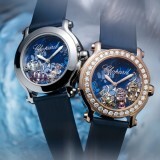 The caseback is made of sapphire crystal in order to let the owner admire the movement. 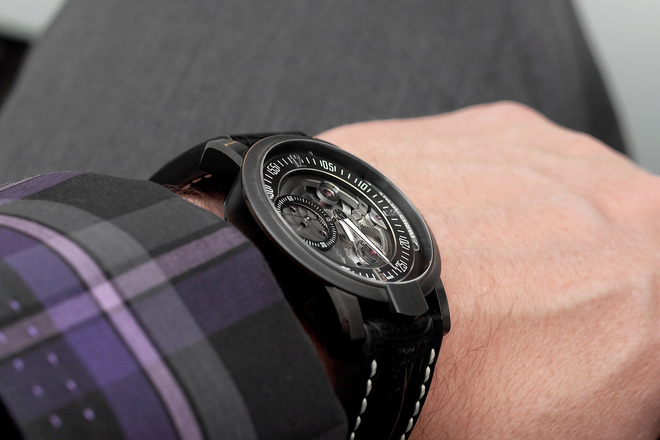 The dial is the main attraction of the Armin Strom Racing Gravity. 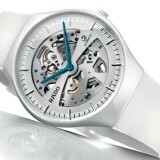 It allows a view on all the technical elements of the movement without disturbing time reading. 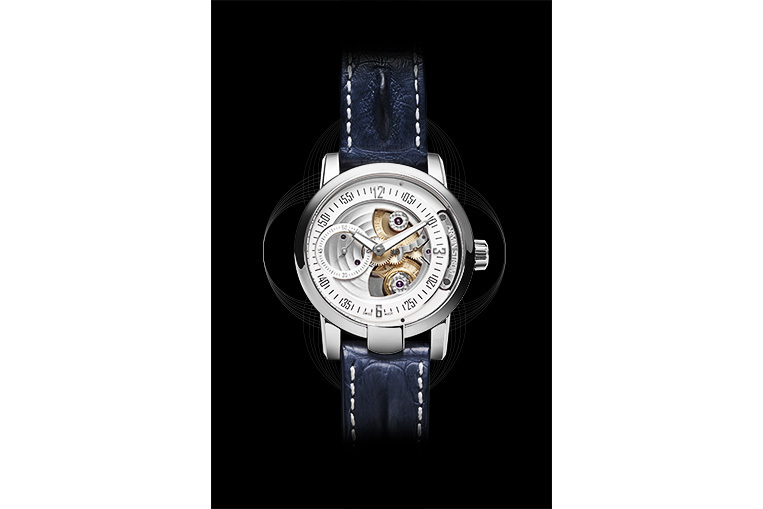 One of Armin Strom’s typical feature is the off-centered dial, slightly moved on the left side of the face of the watch. The space left on the other side is filled with a plate engraved with the logo of the brand and hold in place by two screws. 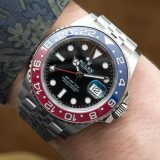 The hours and minutes are indicated by two large hands, generously filled with luminous material. Time can be read on an external black chapter ring, finished with a concentric pattern. Considering that the Racing Gravity is a skeletonized watch, legibility is good thanks to this large and polished hands that pops out from the base plate of the movement. 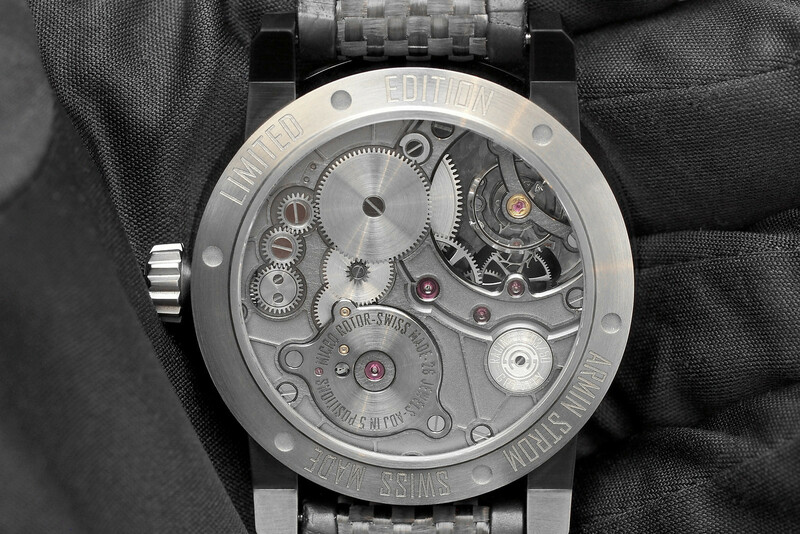 The movement of the Armin Strom Racing Gravity is calibre AMR13, an in-house movement, has 32 jewels and 171 components. 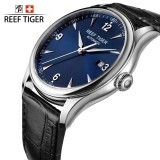 It uses a variable inertia balance, the free sprung balance variety, which means the balance is regulated only by screws on the balance wheel, versus a smooth balance wheel that uses a regulator to shorten or lengthen the balance spring.This is an old school watch making.